This is a novelette from A House of Crimson and Clover series. I reviewed the second book in this series, The Storm and the Darkness, at https://teripolen.com/2013/07/12/the-storm-and-the-darkness-by-sarah-m-cradit/. Although I still haven’t read the first book in the series, St. Charles at Dusk (still in my TBR pile! ), and one of these characters was only in that book, I had no problem keeping up with this story. As I mentioned in the earlier post, Nicolas Deschanel was my favorite character in The Storm and the Darkness, so I was excited to see him again in this novelette. I just love his straightforward approach and ‘tell it like it is’ attitude! I’m hoping one of the author’s upcoming books will focus more on Nicolas – hoping to see him get his happily ever after with a good woman who can keep up with him. Although this was my first time being introduced to Anne Fontaine, it was easy to connect to her character’s strong sense of family and insecurity about her limited finances and education in comparison to the Deschanels’. 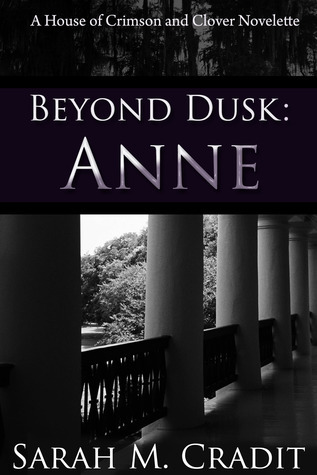 The supernatural aspects of this story made me want to know more about Anne and, like some others who have read this book, I want to see what happens to her character beyond this novelette. The author truly has a talent for character development and plot and I look forward to reading more in this series. I also have to mention again how gorgeous the book covers are! I really liked this one too. I am going to have to read a Storm in the Darkness. Sarah recommended I start there and not book 1. That’s the way I did it (not intentionally), and never felt like I missed anything. You’ll really like The Storm in the Darkness.